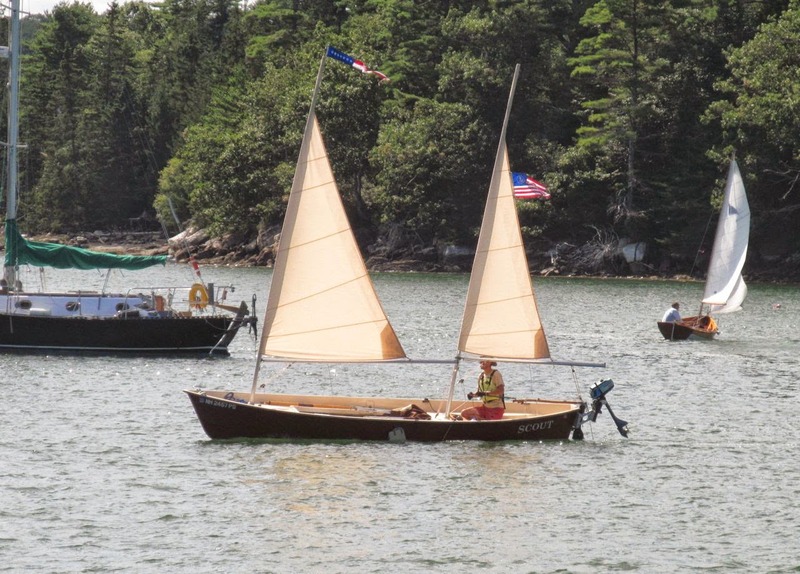 Goat Island Skiff Amateur Style and the Sea Pearl 21 Too: The sail has arrived! 105 square feet of dacron goodness! Wait, wait, wait.... more details please!!! Is that from DuckWorks? How long did it take from placing the order to delivery? Did you order any "extra" features? C'mon, inquiring minds want to know! It is from Duckworks. I bought the sail around Sept. 1st of so, and got it on the 29th.... not bad! When I ordered it they told me it wouldn't take previously mentioned 10 weeks, the sailmaker was catching up on orders. I got the White Dacron sail, no "extra features." But you've got me curious, what do you mean by "extra features?" A window perhaps? The battens came separately and I promptly got some fiberglass slivers in my fingers, so be warned. jeez, you shoulda wrote me first. I could've made you one in Dac for the cost of materials. In fact you coulda gone for Cubex if you wanted. Why don't you just let me build you the rigging anyway. $500 for that is highway robbery. Seriously. That thing probably takes an hour to sew. Do you have dimensions? You have no idea how elementary that layout is. It's on standard spools, sewn together x the belly, with std tri reinfocements. Not to burst your bubble or anything, but any joker with a sewing machine can whip that thing out. Just takes some cleons and a practice square. write me. nice domicile by the way! yea i just worked out the price, for 3.9oz/yd Dacron Poly, the most standard option, the most expensive price is 10.50/yard/36".. the cost for mats would've been 116 no scrap, you'll have scrap, so for 150 tops you coulda had this. Spinnaker mat, goes for a little more, just so you know, but it is childs play. very easy to sew. you need stays and a bigger mast. Alli's parent's house, where I'm living for now. It's not bad, but not permanent, unfortunately.